Filing income taxes online is becoming more popular every year. With the option to e-file (filing tax forms online) and to have your refund deposited directly into your checking or savings account, you can receive your tax refund in a matter of days instead of waiting weeks for a check. You can also choose to prepare and file your return through either the IRS website or a tax preparation website, such as TaxACT, Turbo Tax or Tax Slayer. Fill in the names and Social Security numbers of all your household members, including children. 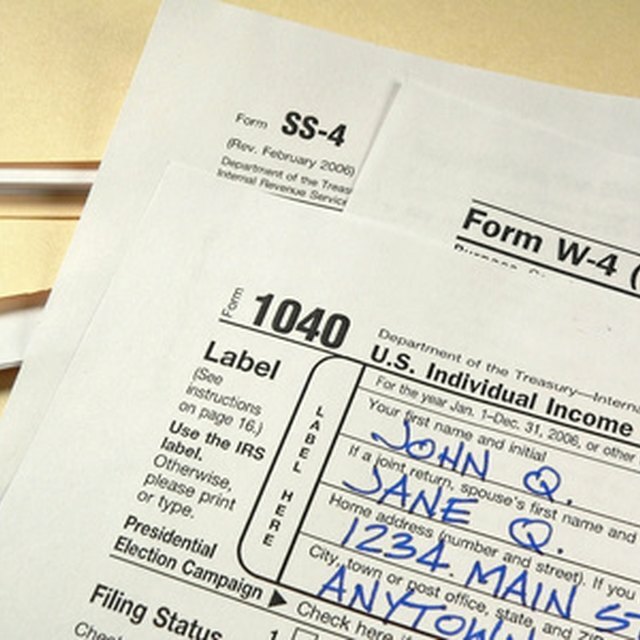 Add your income information using your W-2s from your job(s). If you are using a tax preparation website, it will walk you through putting the information in the right spaces. On the IRS website, the 1040 form (standard form for tax returns) has instructions on where on the W-2 to find the necessary information. Fill out deductions and information on the taxes you have paid. Tax preparation websites will walk you through this portion as well. The 1040 form on the IRS website also offers some help in filling out the form as well as detailed instructions. Request an e-file PIN code from the IRS website. To do this, click the "Request an E-file PIN" link on the home page. Fill in the requested information, and you will receive your PIN in an email. E-file using the PIN provided. With tax preparation websites, there is an e-file fee that must be paid to file online. You can pay with your debit/credit card or checking account. Tax preparation sites also allow you to have the e-file fee withdrawn from your refund. If you use a tax preparation service, you will have the option to continue with your state return at this point. Choose to either receive a refund check by mail or have your refund deposited into your checking or savings account. The time frame you can expect to receive your refund will be listed next to each option. If you choose to have the money deposited directly, you will fill out your account and routing numbers in the boxes provided. Tax preparation services sometimes charge service fees on certain services, such as e-filing and preparing a state return. While this may be inconvenient for some, it is an option that should be considered if you have little experience with filing your income taxes. For people with experience filing their taxes, the IRS website allows you to prepare and e-file your federal return for free if your yearly income is less than $57,000. The 1040 form on the IRS website is the most commonly used form for income taxes. If you have self-employment income, you will be required to fill out form 1099-MISC. If you are not sure that you are filling out the right form or doing it correctly, visit the "frequently asked questions" page of the website. Be sure to include all income and tax information for yourself and your spouse when preparing your return. This also includes savings and stock interest received. If you leave out information, you may not receive the best possible refund and may face an IRS audit. Linda Becksterhed is a professional writer with a legal and crafting focus. She handled creation and distribution of fan newsletters from 1998 to 2001 and maintains an entertainment blog. She is a paralegal and an accomplished fiber artist, specializing in yarn, spinning fibers and crochet and knit designs.